Jim didn’t seem as fazed by the long day as his athletes. But then again, maybe he’s just a bit more used to it. Jim started coaching the team when his son Chris Thornton, now 29, was in high school. The old Magic City Olympians’ coach couldn’t take the team to the state competition, so Jim and his wife Kathy volunteered. From there, it’s history. Jim’s been coaching the team ever since, and Kathy helps out with the paperwork and keeps the team organized. Coach Jim Thornton cheers on his team, the Magic City Olympians during a basketball game. The team of adults from Moberly, Mo., competes in various sports for the Special Olympics, including basketball, bowling and track and field. Jim said his relationship with the team is fantastic. While Jim and Kathy could have just held an occasional practice and taken the athletes to the standard Special Olympics events, Jim said they decided to take it a step further. In a small town like Moberly, he said it’s important to keep the team active and off the couch. So Jim and Kathy are constantly thinking of new ways to get the athletes together; he said they’ve hosted fishing tournaments, holiday parties and a variety of other events. The team also meets every Wednesday at Memory Lanes bowling alley in Moberly where even the athletes who don’t compete in bowling get a chance to get out of the house and participate. In fact, Jim said the lanes are open to all people with special needs from 3-5 p.m. on Wednesdays, and the manager gives them a break on prices. Durrender Fink is one of Jim’s athletes who competes in both bowling and basketball. She’s been on the team for about a year. It was last month when the team competed in the Special Olympics Missouri State Indoor Games. The event was held Friday, March 18, through Sunday, March 20, at Fort Leonard Wood and Waynesville High School. The team loaded up into two vans that Thursday night, one driven by Jim and the other by his brother Rick Thornton. The days were long, with wakeup times before 6 a.m. and the days not coming to an end until after 9 p.m. 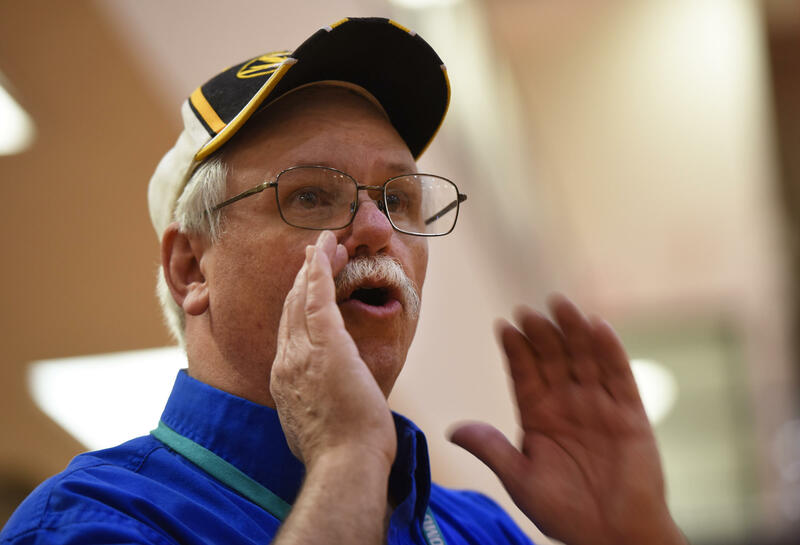 While the athletes yawned off their exhaustion Saturday morning and Rick fell asleep on the bowling alley floor, Jim was running around like the energizer bunny, cheering his athletes on and helping out wherever he was needed. If Rick had to describe his brother in one sentence, he said it’d actually just be one word: Awesome. Rick said Kathy deserves credit too; as husband and wife, they make a pretty good team. Rick said he knows Jim and Kathy got involved with the team because of their son, but now everything they do is for all of the athletes. Rick also described his brother as a second dad to many of the athletes, and Jim said that makes him feel proud. Jim said his favorite thing about coaching is the athletes. The feeling is mutual. Christopher Stevens is another one of Jim’s athletes. He’s been on the team for almost 8 years. Jim said that even though he’s been coaching some of these athletes for more than a decade now, they still continue to surprise him. When the team competed in Jefferson City for the regional basketball competitions, he said he watched his son and other members make shots he didn’t know they could make. Jim said he’d rather coach the Magic City Olympians than a high school team.